Waiting an extra 24 hours in the death zone I would not wish for anyone. But maybe it was worth it for this shot? Beautiful! This shot is magic. You are really lucky to have been there. By the way, how does the camera behave in such a cold weather ? Did you have to protect it in special ways ? By far the greatest from the tent picture I have ever seen. 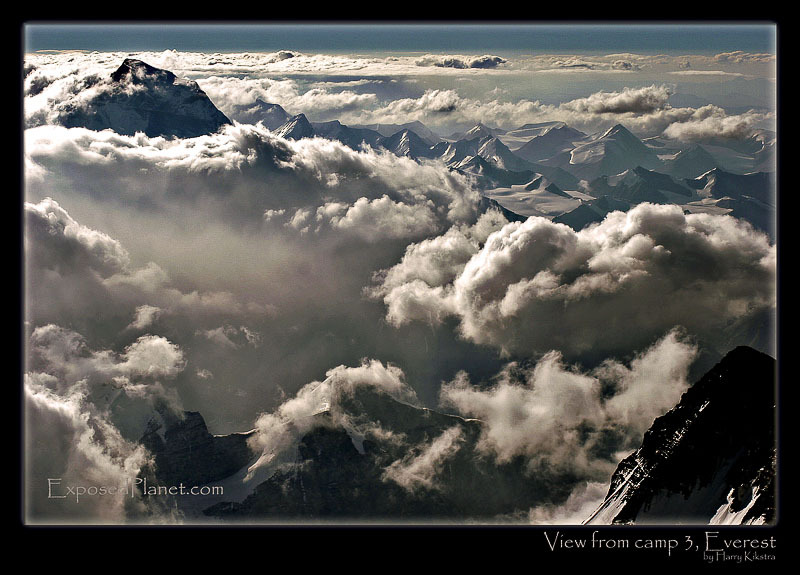 The story behind "View from Camp 3 on Everest, Tibet"
We had planned to go for the summit the nigh before, but when waking up at midnight the storm was so incredible strong that we could not leave our tents for the next hours and when it got better it was too late to go up safely. So we waited until the next night and just before sunset I could capture a part of the wonderful view that was opening around us, straight from my tent that was perched on a sloping rock-platform.